We here at Baeble have a small confession to make: Recently, we filmed a very special and unique acoustic session with an awesome up-and-coming band, and we've been so hyped for the release of the video that we totally forgot to tell you about the band! Our bad, hope you can forgive us, because you'll definitely want to get to know Mainland, a sweet new band that we were very lucky to have perform in our office. 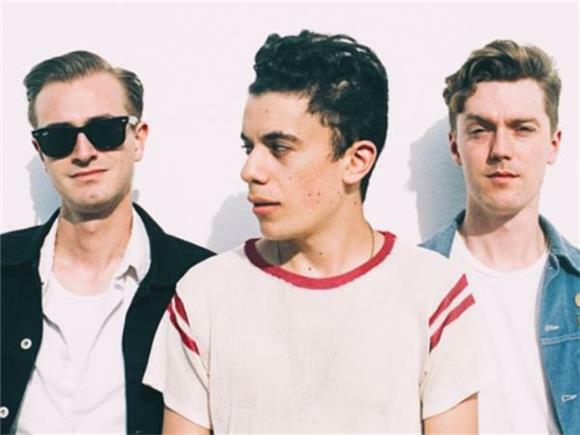 Mainland-comprised of Jordan Topf on vocals and guitar, Corey Mullee on guitar and synth, and Alex Pitta on bass-is a NYC-based band who takes cues from the Cure, New Order, and Depeche Mode and blends it with some garage-rock sensibilities to make a fresh take on post-punk and indie. After blasting onto the scene with their 2013 EP Girls Unknown, the band quickly gained well-deserved traction and found themselves working with Spoon's Jim Eno on their 2014 follow-up EP Shiner. Songs like the EP's title track show off Jordan Topf's satirical take on New York City nightlife, and the pressures that come with deciding between drinking too damn much or calling it a night. The band's loud-but-calculated style of rock music caught the attention of many high profile trendsetters, like Consequence of Sound and Rolling Stone (and us here at Baeble), and earned them opening slots for other bands dominating the rock charts, like X Ambassadors and Catfish and the Bottlemen. Things are certainly on the up-and-up for Mainland, and on their most recent 2015 EP Outcast, they progressed their sound even further by flying to Los Angeles to record with producer Kevin Augunas (whose past work includes bands like Cold War Kids and Edward Sharpe & the Magnetic Zeros). With their new batch of songs, the Band ups the production quality and injects some laid-back West Coast vibes into their sound, making for some of their catchiest tunes to date. "Outcast," the title track and a highlight of the EP, is an upbeat song taking on the feeling of being left out, brilliantly following the tradition of "happysad" songs made famous by the Smiths. "It's about finding an identity," Corey Mullee told us during the band's session, "and taking a kind of pride in a status as an outcast, because it can be used to your advantage sometimes." Most recently, just a couple weeks ago in fact, the band dropped their newest single "Beggars," which has been met with praise from critics and fans alike. A stomping drum-led track with sharp lyrics and a spirit-lifting chorus, Topf says the song is all about "keeping your head up while you're on your grind, on your hustle." If this song doesn't have you feeling like you can take on all the haters by the time it's finished, absolutely nothing will. Be sure to check back in on Tuesday, July 12 to watch Mainland perform an acoustic version of "Beggars," plus a couple songs from Outcast, live from Baeble HQ! We had a great time watching them perform and talk about their music, and we hope you will too.